Bird feeders are the the fastest way to attract birds to your yard. There are many types and styles to choose from. Trying to decide which is best can be a difficult task. But, as you'll see in the article below. Each type and style has a purpose. What decides whether one type is better than another is what you expect out of it. In this article we will discuss the types of feeders, how they are used, and what birds you can expect to see when using them. Most people will have a greater variety of birds by offering as many different styles as they can. One of the most sought after feeder types are those that are Squirrel Proof. These are designed to foil squirrels and keep them from devouring all your bird seed. 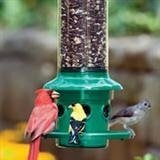 For a selection of these check out our Squirrel Proof Bird Feeders page to select the one that is right for your needs. Each will attract a variety of birds to your backyard. On the other hand, squirrels can be fun to feed and watch but shouldn't cost you an arm and a leg in sunflower seed and suet. If you want to attract these furry creatures to your yard, try using some of the Squirrel Diversion Feeders. 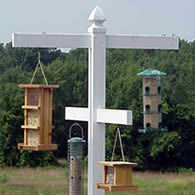 These are feeders specifically designed for attracting squirrels away from your seed feeders. A good idea if you just can't keep them off your favorite feeder. 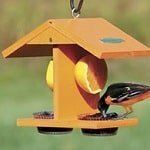 This gives you more opportunity for attracting and keeping birds in your yard. Now let's continue learning about feeding birds. Knowing what birds you want to attract, will help you in choosing the correct feeder. Additionally, knowing what types of animals and birds you wish not to attract, (squirrels, house sparrows, starlings) will help in your feeder decision. for Squirrel Control These are cylindrical in shape and have openings large enough to give birds easy access to the sunflower seed that they hold. If squirrels are a problem choose one that has a wire cage around the openings. I've found them to be very effective. Another hanging tube type is the Thistle Feeder This looks the same as the one mentioned above except the openings are very small. Thistle or Finch feeders are made to hold nyjer seed which is very small. There is no need to protect this one from squirrels since they don't seem to like this type of seed. The House or Hopper style is a common attractive type of bird feeder. This type is as charming in the landscape as it is functional. 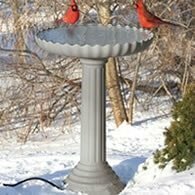 Larger ones can hold several pounds of sunflower seed and attracts those birds that are not likely to visit a bird feeder of the tube type. Some birds, such as Cardinals, are more comfortable with a perch or platform from which they can feed from. These types always provide a landing area. The House-Hopper style needs to be mounted on a post or pole, a squirrel baffle is a must on this type. Make sure the model you get is easy to fill. If you are not offering suet at your bird feeders, you are missing out on a lot of bird watching action. Woodpeckers, nuthatches, and tufted titmouse, are just a few of the many birds that are drawn to this food source. The most common type of suet feeder is a wire coated basket type. While you can offer suet in nylon or onion bags, I prefer the wire basket types as they are squirrel resistant. Suet cakes can be bought at almost any store where you find sunflower seed. You can also make your own. 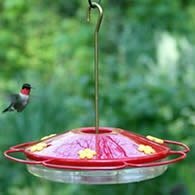 For a wide selection of these, check out our hummingbird feeders here.While those of us in the northern parts of the country can only use hummingbird feeders for part of the year, there are a lucky few that are able to feed hummingbirds for most of the year. For those individuals and others that may be so inclined, I'll refer you to the humming birds page on this site. 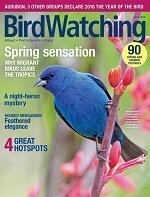 You'll find recommendations for bird feeders and a simple recipe for sugar water. We have already covered suet, basically a beef fat rendering with added ingredients of seeds nuts and in commercial types, berries. Far and above the best seed to offer in order to get the most types of birds is Black Oil Sunflower Seed. Dozens of birds will come to your bird feeder. If you only offer one type of seed, this is the best choice. Nyjer seed, also inaccurately called thistle seed is a very small black seed that the finches are drawn to. I like offering it because the squirrels don't like it and I'm able to place the feeder anywhere I want without any concern with squirrels. 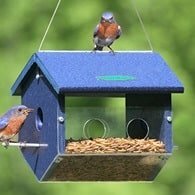 Those inexpensive bags of bird seed you see on the shelves of stores are best used on platform feeders that are just a few inches above ground, and not in the hanging and pole mounted feeders. Cracked corn, and less expensive seed for those birds that feed at ground level will reward you with juncos, mourning doves and many others. Begin to think about a bird feeding station instead of just one bird feeder. You'll be rewarded with a variety of birds you didn't even know you had access to. Bird feeders are one of the quickest ways to guarantee you have birds to watch in your yard.